IT destroyed the Minoan civilisation and sent shockwaves through history as the legend of Atlantis. Now, the volcano of Santorini is stirring again. Almost four thousand years ago, the island of Santorini was probably much as it is now - a scenic retreat for the Minoan's wealthy and powerful. And history may be set to repeat itself: Magma has been detected once again pouring up to 20 million cubic metres of molten rock into chambers deep beneath the idyllic island. A report in the scientific journal Nature Geoscience says the island has lifted as much as 14 centimetres in recent years. And seismic sensors placed around the island earlier this year registered a string of small earthquakes - the first after 25 years of dormancy. A reconstruction of how the island of Thera (Santorini) may have looked at the time of the Minoan civilisation. From the hints and clues unearthed in the buried town of Akrotiri, the island was an important and extravagant trading hub - with remarkable similarities to the mythical civilisation of Atlantis. One ancient wall map clearly shows a palace built upon a small island embraced by another ring-like island. 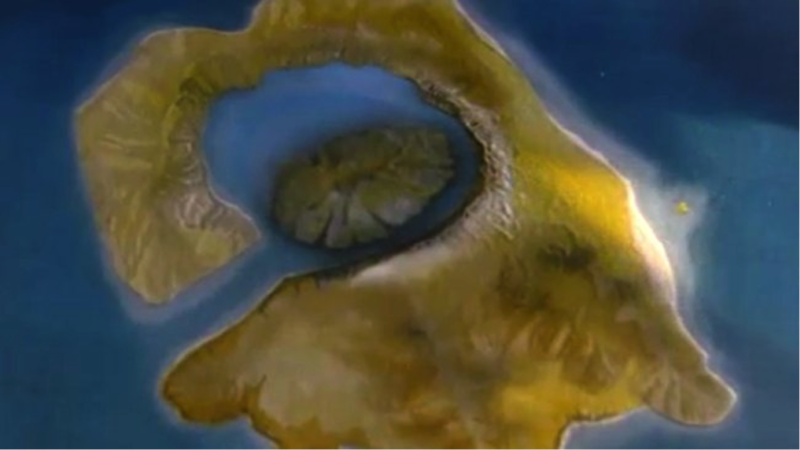 Roman historian Plato said Atlantis was an island of concentric rings. What the ancients didn't know was that the mound they had built upon was the peak of a volcano, nosing out of the water-filled caldera of an even more ancient volcano. A resort high on the cliffs of the island of Santorini. The peak of the new volcano can be seen in the bay. One of the most violent volcanic eruptions in recorded history blasted much of the island into the ocean - vaporising the central palace and burying settlements under metres of volcanic ash. The resulting 12 metre tsunami devastated the Minoan coastal cities on nearby Crete. It was a disaster the civilisation never recovered from. Knowing Santorini is a volcano has not stopped the island from once again being turned into an island resort. It is a regular stop-over for cruise liners and Greek-island holidaymakers. 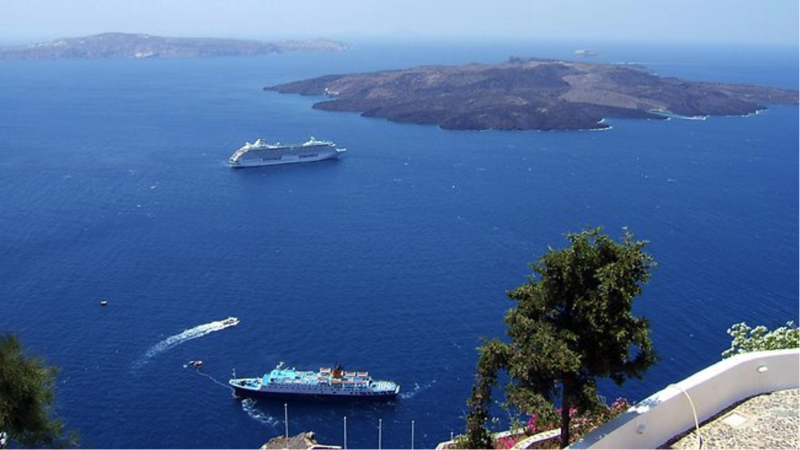 Cruise ships muster in the bay of the island of Santorini. The volcanic peak can be seen at the top-right of the image. "Although Santorini is well known for its large explosive eruptions, these probably only happen every 20,000 years or so," Oxford University researcher David Pyl said. Smaller, more frequent dome-forming eruptions can happen as frequently as every 14 years. The volcano had its last significant eruption about 70 years ago. 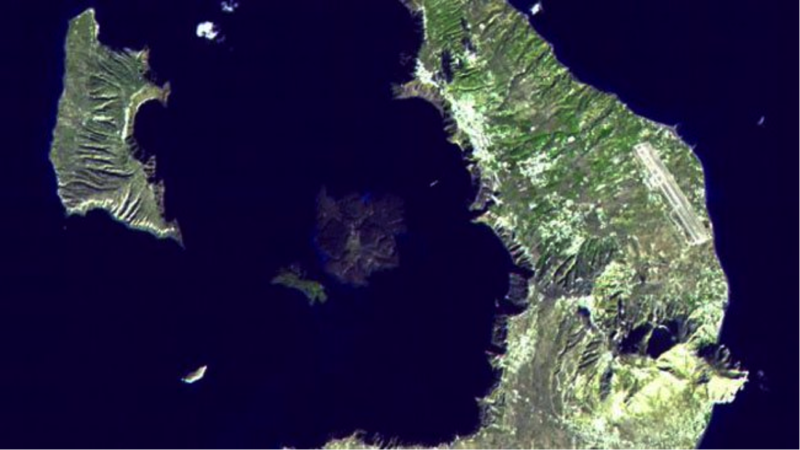 The murderous heart of Thera-Santorini can be seen emerging from the waters in this Landsat image of the island. "If the present rate of inflation were to continue for a small number of years, the intruded volume would be equivalent to the volumes of previous eruptions," the researchers said.